Why sour cream? Because that was what I had in the fridge at the moment, and it worked quite well as a substitute for whipping cream. This recipe calls for 10 tbsp of sugar, which is quite a lot for a typical muffin recipe, but surprisingly it doesn’t taste awfully sweet like store bought muffins. I consider myself not a big fan for sweet stuff and I think the amount of of sugar is just right. Preheat oven to 375F. Line muffin molds with muffin cup liners. In a separate bowl, combine sour cream, milk, eggs, vanilla extract. Whisk to blend well. Add cream mixture and melted butter to flour mixture. Gently FOLD the batter with a spatula until just moist. FOLD in blueberries. Scoop batter into muffin molds. Bake at preheated 375F oven for 20-25 minutes, until the muffin tops springs back when gently pressed. 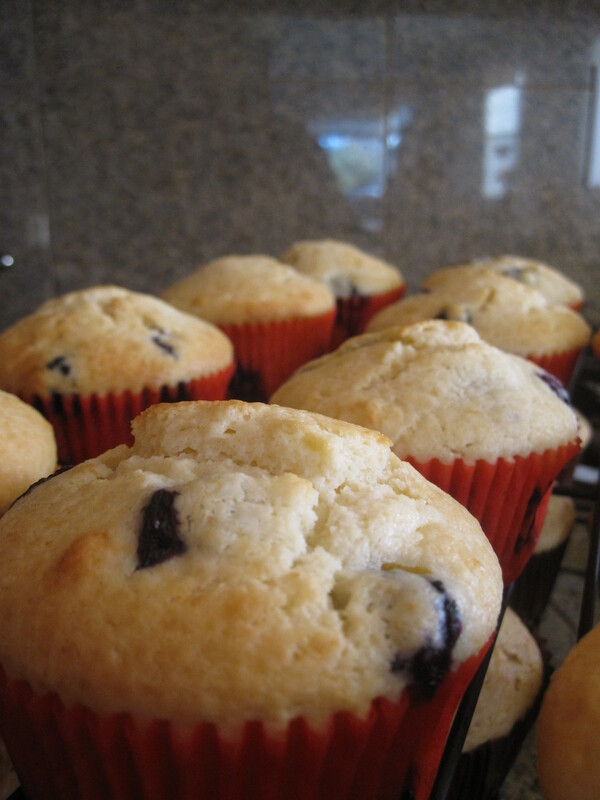 Remove muffins from molds immediately and transfer to a cooling rack. Let muffins cool slightly before serving. Best if served warm. Sour cream: I had only about 5 oz of sour cream so I added a little more milk to fill to 1 cup (milk is a thinning agent here as sour cream is pretty thick). Alternatively, you can also use whipping or heavy whipping cream alone without combining with milk. Oven temperature: If you want crusty muffin tops that resemble of the crust of a cornbread, you can bake muffins at preheated 400F oven for 20-22 minutes.